The method getFromLocationName(String locationName, int maxResults) returns an array of Addresses that are known to describe the named location. The query will block and returned values will be obtained by means of a network lookup. The results are a best guess and are not guaranteed to be meaningful or correct. It may be useful to call this method from a thread separate from your primary UI thread. Modify the last exercise "Get list of address from location using Geocoder", the returned address of the clicked item is passed to getFromLocationName(), to get the location(Latitude and Longitude). Suggest to test on true device. In my tests, it doesn't always work on emulator! i have tried this code but it does not work for me.when i try to run force close error comes. Make sure the "3G" icon is on, it need online service. Hi, I am beginner to Android and I want to get just lacation (lat and long). How can i do that? Check the code, returnedaddresses.get(0).getLatitude() and returnedaddresses.get(0).getLongitude() are the returned lat and long. why is that..is it because of 3g like u said before?if yes,how to turn it on ?does exist in emulator? Just re-tested the exercise again and again, it seem not always work on emulator! Sometimes ok, sometimes not ok as your case! But work on true Nexus One running 2.2.1. So I think it's problem of emulator. this example gives the same address every time because you set the LATITUDE & LONGITUDE on the java file..?.if you change location will still show the same address? if i want to have the address i am without giving the LAT LONG what should i do? Yes, the LAT & LONG are hard coded, so the returned address is always the same. You can implement two EditText for user to enter LAT & LONG. Geocoder is a online service. Thank you very much for the nice guide. Being a beginner myself, I have few questions in mind. Could you please guide us through the requirements for the Manifest File of this application. Would be nice to know which API level you are targeting in this current project (Also Google API / Android API). 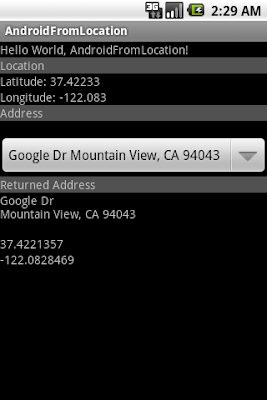 how can get latitude and longitude of two locations at one time for showing root of two location on goggle map in android? - you can use Geocoder(http://developer.android.com/reference/android/location/Geocoder.html), here (http://android-er.blogspot.com/2011/02/get-address-from-location-using.html) is my example, but it seem not available sometimes. I want to send lat long to a particular ip address... so can you give me code...??? Control Flash Light, function as a torch.